Game of Thrones Season 6: Can High Sparrow Really Overthrow an Empire? In the last season, Cersei Lannister tried to out-maneuver the Tyrells and empowered the faith militant to summon Loras Tyrell and extract an admission out of him that he indulged in an illegitimate relationship which is against the tenets of the church. Moreover, Queen Margery knew about it and decided to hide it, led to her arrest as well. Cersei thought she scored a massive victory over Tyrells, but soon her past came knocking at her door. Peter Baelish/Little finger possibly told Queen of Thorns/Lady Olenna about Lancel Lannister and Cersei’s obnoxious relationship leading to her arrest by the same faith she empowered culminating in an infamous “Walk of Shame” for atonement. High Sparrow is literally the new “power center” at King’s Landing now, he is riding on a high horse believing he is the messenger of mighty Gods. He had a brief encounter with Lady Olenna in the last season, she threatened him that House Tyrell will cut off food supplies and other essentials which feed the masses and the church will come begging to her. He invoked his holiness and said that “whether it’s sons of high-lords or fishermen, they are all equal in the eyes of the gods”. He further said to her that “the lifetime of wealth and power has left you blinded, you are the few, we are the many”. In the season 6, High Sparrow meets King Tommen and Lord Commander Jaime Lannister, he again claims his actions are god’s will, but Jaime brought out the hypocrisy in his word and deed. He asked him why is he not being arrested and put before Gods, he broke his sacred oath and stabbed his own king from the back, killed his own cousin and helped his brother escape justice that so called “gods” bestowed on him. When Jaime reached to his sword, faith militants surrounded him with sharp objects in their hands. High Sparrow really think that he could unite the ordinary folk of Westeros and could overthrow the powerful armies of major houses. 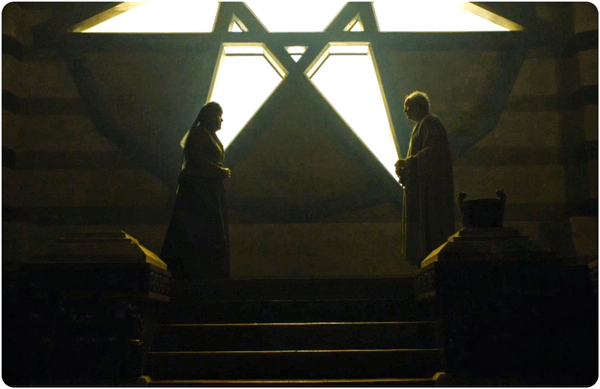 Are we going to see a big “red wedding” level incident as Lady Olenna and Cersei join hands against a common enemy?